Ah, eBay! Such a wonderful thing. I had a sneaking suspicion that there would be a person or two out there looking to sell old Steve Guttenberg movies. That's right. 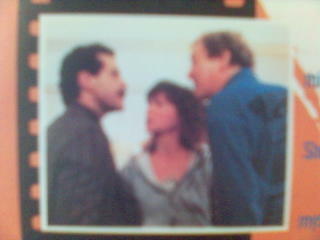 It's 1987's Surrender. And it didn't look like it would be too bad. 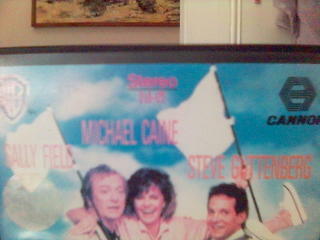 It has Michael Caine and Sally Field. And they're both good actors. And we all know that I love the Gütt. Once again, he doesn't recieve top billing, but he's still got quality above the title billing. But it was the photo on the back that really captured my interest. So, it was with some quite high expectations that I sat down to watch this film. And did it disappoint? Sweet mother of God, yes. Ooh, what a bad movie. So very very very bad. So very bad. I really can't say that enough times. So so so very bad. "Surrender" is an astonishing case of a movie that can do no wrong for its first half and little right thereafter. The story has no place to go, and Belson's contrivances in keeping it floating are desperate. Steve plays Sally Field's rich lawyer boyfriend, and I'm sad to say he's a bit of a jerk. I'll confess I didn't pay much attention to the movie because I kept getting bored, but the Gütt did what he could with what he was given. I knew that completing this mission would mean watching some bad movies. But until this, I had no idea how painful that could be. Ah well, I can only hope that Film #4 is a little less upsetting. Aren't you wacky North Americans lucky? Starting this September, you'll be able to see the always delightful Mr. Guttenberg in UPN's one actually good show - Veronica Mars. There are fabulous reports that Steve, along with Charisma Carpenter, will join the show for it's 2nd season. Steve has been cast as "a charismatic major league baseball team owner and leading candidate in the race for mayor of Neptune. " He will be in at least seven episodes. How delicious! I, for one, cannot wait. "Now, I don't want you to get too over excited here, but I am about 70% certain that my sister has the VHS of Three Men and a Little Lady, which I am 100% certain that she won't want anymore. I'll speak to my parents to make sure they still have it, and then I'll let you know. Please, don't build your hopes up, it could well be Sister Act 2 that I am thinking of. I would hate for you to be disappointed and think bad of me." Well, this is clearly a delight! A lead on Film #3 so soon after the arrival of Film #2? Fantastic! I'm sad for Abby's sister that she wouldn't want to hold on to this cinematic gem, but it's obviously fantastic news for me. And how could I possibly think badly of anyone supporting the mission? I think this could be a hidden treasure trove of Guttenberg goodies - if y'all could have a look through your video collections for stray and (unbelievably) unwanted Guttenberg films, the mission would be in your debt. It's been an exciting weekend in the world of the Steve Guttenberg Project. On Saturday, I left the house to a bit of shopping. When I got home with my new shoe racks (they're very nice), I found an Amazon package near the front door. "Hmmm," I thought to myself. "I haven't ordered anything from Amazon recently, but perhaps it's for me anyway." And, would you believe it? It was! Inside this beautiful package was a DVD - and not just any DVD. 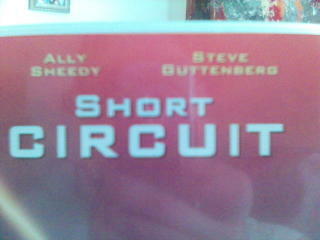 It was a DVD starring our good friend ... Mr. Steve Guttenberg. I was giddy with glee, as you can well imagine, and scrambled to find the packing slip to find out who was responsible for the exciting new development - after all the collection had doubled overnight, and it was all very fabulous. To my delight, I found that a little lady with a mission of her own was the generous DVD purchaser - the lovely Miss Heather Taylor. As we can see, the Gütt once again receives second billing. For those of you who haven't had the pleasure of seeing this fantastic film, the Gütt plays one "Newton Crosby" - inventor of robots and other such things. When the delightful Number 5 suffers from a "short circuit" and comes to life, Newton is sent on a madcap adventure with trusted sidekick Fisher Stevens to find the rogue robot. Does mayhem and merriment ensue? Oh, you bet it does. There's also a bit of romance, between our Mr. Gutt and the lovely Miss Sheedy. Robots? Romance? Stray animals? "Number 5 is alive"? The Gütt? Once you start looking, you realize that there are tributes to our good friend Mr. Guttenberg everywhere. I'm sure you're all familiar with the episode of the Simpson's featuring the classic Stonecutters Song. Season six? Episode 12? "Homer The Great"? Originally aired on 8th January, 1995? You've seen it seven billion times in reruns since then? The song is an all time classic. Sing along with me, if you will. Well, if you made Steve Guttenberg a star, then the world owes a debt to you, Stonecutters. Thanks, from all of us. Film #1 in the Steve Guttenberg Project. Isn't it delightful? 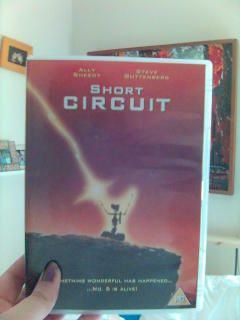 You can see that it cost me a mere £3, which I think you'll agree is a fantastic price for such a cinematic gem. It may not be a cropped white denim jacket, but I think it's pretty frickin' sweet. 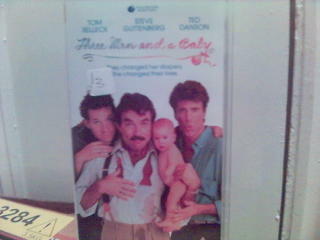 Clearly Tom Selleck is the star here - he gets first billing and the centre of the photo. 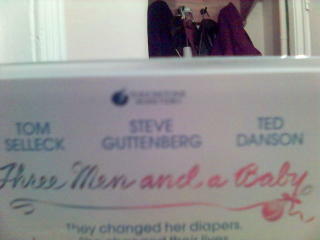 But we can clearly see that our good buddy Steve Guttenberg is the second billed. Screw you, Ted Danson! It's all about the Gütt here! It came like a flash of inspiration - a plan. A plan to begin a mission. A mission to complete the Steve Guttenberg Project. It's a humble mission. It may not save the world, or end world hunger, or even get the building work outside my flat finished. But it will, if the mission is successful, gain me the most fabulous film collection ever imagined. And it's here, in this very blog, that you can follow the progress of the Project.